I don’ t know about you but I go to the State Fair for the food. I love all the favorites: funnel cake, corn dogs, roasted turkey legs, cot to candy and ice cream. But I love all the new things that they are serving up. Everything from chocolate covered bacon to deep fried butter on a stick! My family and I attended the Alaska State Fair this past weekend and we took our fair delciaies to an all new level. 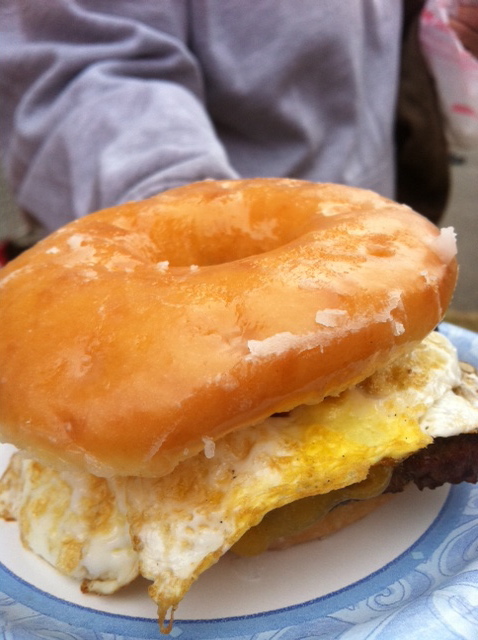 It was a charbroiled burger with bacon and egg and on a glazed donut. When my son, Tyler and I saw this we literally sprinted over to the food stand and laid down our 20 bucks–10 bucks a piece: yes, a little spendy even by Alaska and fair food standards. We really didn’t know what to expect. But it was surprisingly good. The sweetness of the donut was a perfect compliment to th bacon and egg and the smokiness of the burger completed this midway treat. What do you like to eat at the fair? I went for the corn fritters and chicken fingers with a tasty BBQ sauce. I did not dare try the heartattack burger that you guys had. Nothing compares to the Chowchilla Fair. That was my hometown. After the parade and stampede down main street, the whole town would gather and stand in line for the best BBQ in the valley! It still ranks high on my list. Pit BBQ pulled pork with all the fixins’. I loved going to the fair with you!